Osmosis is a process in which a solvent is passed through a semi-permeable membrane, in order to balance a difference in solute concentration. In biology, this most often means water passing though the cell membrane due to pressures caused by the different environments inside and outside of a cell. The direction of osmosis depends on the osmolarity of the inside of a cell, compared to its environment. If a cell is in a hypotonic solution (meaning the solutes are less concentrated), the water will have the tendency to pass into the cell via osmosis. 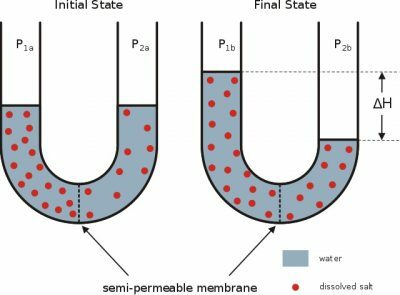 If the cell exists in a hypertonic solution (which has more concentrated solutes), the water will tend to travel by osmosis out of the cell to balance the concentration difference. If the cell is in an isotonic solution (the same concentration as the cell), water still travels through the cell membrane via osmosis. However, the water going in equals the water leaving the cell over any amount of time. Osmosis is driven by the osmotic pressure of any given system. In a typical biological system, this pressure is created as the cell amasses various ions, organic molecules, and other substances inside the cell. Each molecule or ion requires water molecules to dissolve it within solution. The osmotic pressure on a cell membrane is determined by the overall difference of solutes inside and outside of the membrane. The process of diffusion would naturally carry solutes to an equilibrium throughout the solution. 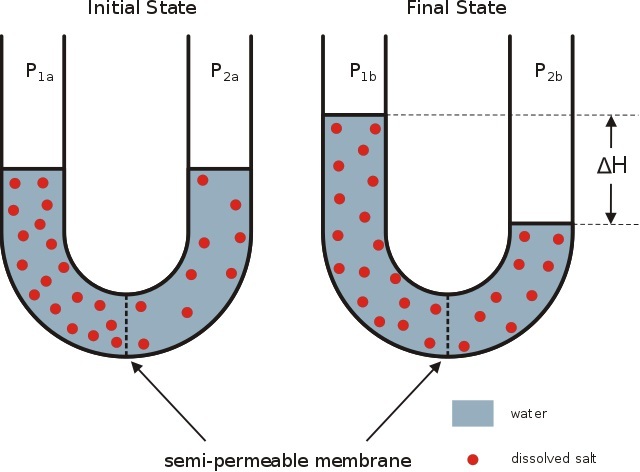 With the cell membrane blocking and inhibiting the natural passage of solutes, there are chemical and electrical forces which favor the redistribution of water across the membrane. This is osmosis. As the water passes through the membrane, the concentration balance is alleviated, and the osmotic pressure falls. The passage of water is often aided by small protein passages within the cell membrane, known as aquaporins. The concentration of ions is also manipulated by a number of proteins through active and passive transport. The process of osmosis can be easily demonstrated in a laboratory. Though there are many versions of this experiment, the simplest version can be seen below. This system shows a U-shaped test tube, with a semi-permeable membrane separating the two sides. The membrane does not need to be a cell membrane, and is often made from dialysis tubing. This material has small holes through which water can pass, but solvents cannot. In the initial state, the sides of the tube are loaded with the same volume of water, but different concentrations of solute. Over the period of several minutes after the initial situation is established, the water will move through osmosis to the side with a greater concentration. The salts on this side, which cannot diffuse to the other side, create an osmotic pressure. This pressure is relieved after osmosis takes place, and can be seen in the raised water level on one side of the tube. Plant cells use the process of osmosis to their advantage. Plant cells have two components which aid in this process. They are cell walls and central vacuoles. The central vacuole is a water-holding organelle within the cell, which stores excess ions and molecules. In doing so, it ensures that osmosis occurs into the vacuole, making it swell with water. This organelle swells until it pushes against the cell wall. This wall is outside of the cellular membrane, and is made of specialized proteins and cellulose. This wall holds its shape, and as the central vacuole fills up, it exerts pressure on the cells. This is known as turgor pressure. Although the pressure in each cell is small, the process of osmosis in cells across the plant ensures that the whole organism stays rigid and upright. Plants can control osmosis by changing the concentration of ions within the central vacuole. By doing this, they can actually move their stems and leaves in order to collect sunlight more efficiently. Animal cells also have to deal with osmosis, but they do so in a very different way from plants. In vertebrates, this action is largely carried out by the kidneys. The action of the kidneys is determined by the environment in which the organism lives. Organisms in a marine (saltwater) environment suffer a unique problem. The saltwater is much more concentrated than their cells (it is hypertonic). This means that water will have a tendency to move out of the animal by osmosis. To combat this, their kidneys must actively save water and move salt out of the body. Some marine organisms increase the concentration of solutes in their body to avoid this problem. Freshwater organisms suffer the opposite problem. In freshwater, the water is less concentrated than the cells of the organism. This means that water is constantly moving into the body. In the kidneys of these animals, the osmosis of water into the body is offset by the removal of water through the kidneys. Terrestrial organisms suffer a different situation, losing water through evaporation. Osmosis in the kidneys and colon help retain as much water as possible in order to offset this loss. 1. Which of the following is osmosis? 2. In which situation will net movement of water via osmosis NOT occur? 3. An aquaporin is a pore within the cell membrane which allows the passage of water. This passage allows water through, but blocks most solutes. A central vacuole has many aquaporins. Why?